I had my first smear of Kerrygold Irish butter. All butters are not created equal. Amen. Remember how Mr. Dessert For Two boldly declared he likes fruit desserts now? 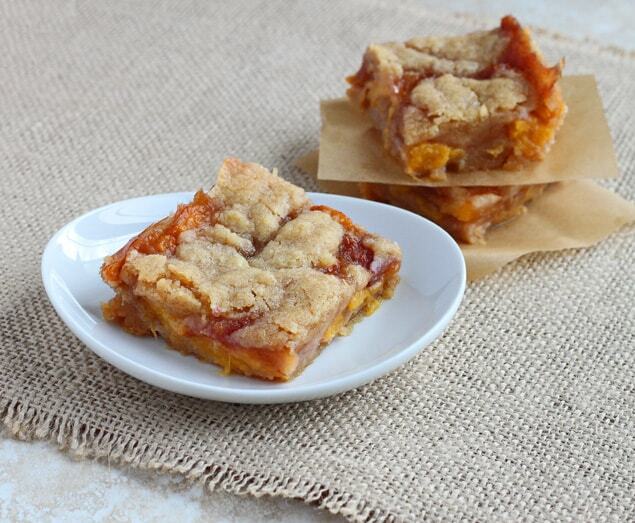 These buttery peach pie bars are the thing that tipped the scales. He took one bite of the soft, cinnamon-flecked crust and whiskey peach jammy filling, and moaned. From my experiments, I’ve deduced that the moans signify that his love for fruit desserts is equal to his love for chocolate desserts. That’s the power of pie, my friends. I used almost an entire stick of Kerrygold butter in this pie bars. While I made the dough, I let 3 peaches soak in way too much whiskey. I pressed 3/4 of the dough into the pan, poured my drunken peaches over top, and then crumbled on the remaining dough. Forty minutes later, the peaches melt into a jam-like consistency. They’re nothing short of spectacular. Use the good whiskey for these bars; you won’t regret it. I used rye whiskey. Makes 2 bars in a 9" x 5" x 2" loaf pan. Preheat the oven to 350, and have ready a 9" x 5" 2" standard bread loaf pan. Begin by peeling the peaches and slicing them into slices about 1/4" thick. Place them in a bowl, pour the whiskey and brown sugar on top. Let soak while you make the crust. To make the crust, combine the butter, sugar, flour and cinnamon in a bowl. Place 1/4 cup of the dough aside, then press the rest in the bottom of the loaf pan. Pack it firmly and evenly. Stir the cornstarch into the drunken peach mixture, then pour it over the crust. Crumble the remaining dough on top. Bake for 40 minutes, until fragrant and golden brown. You must let these bars cool completely before cutting them! 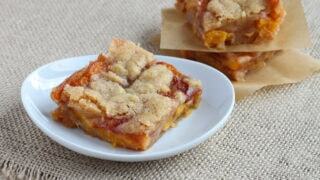 Hmm I happen to have a few very ripe nectarines in the fridge, might have to make these and use them! These sound absolutely lovely! Yum! Mmm peach and whisky, perfect. I love the idea of those sweet sticky boozy peaches. you’ve had me really curious about kerry butter since!!! It’s sooo worth it, Lynn. So creamy. After tasting it, I can tell other butters have more water than fat. That Kerrygold stuff is like crack. It’s like butter on top of butter with more butter. I shudder to think what it tastes like when browned. I know these bars have got to be absolutely amazing! they look and sound just too good to be true! I love the idea of boozy peaches! Mmmm. Just the sound of peaches and whiskey has my attention! And yes, KG butter is the best! I have peaches taking over my kitchen right now and a peach dessert on the brain for later too. Definitely that time of year! Kerrygold is some good stuff, had it in Ireland last year and was totally hooked! Whoa – just stumbled across your site…perfect! Don’t tell my wife about this – I’m going to take credit for all of these desserts for two and rack up some bonus wife-points! You’ve got yourself another reader Christina! I had to laugh at point six of in the instructions. Really? :) Waiting never happens around here, even if I have to take pictures. I just have to try it right away! These look incredible and I’m going to make them tomorrow or on Wednesday. I rarely make anything without healthifying it, but this? This will definitely be made as written. It’s too good looking to mess around with! Kerrygold is the best. And so are boozy desserts. Love these! I love Kerrygold! And I must make these! I’ve been eating peaches nonstop lately. They are so good right now! Need to make this. I haven’t baked with peaches ever, yet I adore peach pie and peaches in general. I really want to try making these this summer – they sound and look fabulous! Yep! Sounds perfect to me! from everyone’s reaction it sounds as though i really should try some kerry gold butter. i wonder if i can find it around here? i’m not familar w/ whiskey’s do you have one you would recommend. i do have some peach schnapps i wonder if that would work? or perhaps some apricot brandy…. Hi Jacquie: I think any kind of liquor would be great here. I used a rye whiskey named ‘Ri.’ It happens to be my fiance’s favorite, so we had it on the counter. These just came out of the oven and I’ve already eaten quite a bit. Delicious! I was a bit worried about all the the peach / whisky liquid, but it came together perfectly and wasn’t soggy at all. The only thing I did differently was to add 1/2 tablespoon instead of a teaspoon of cinnamon. And I love how huge your servings are. Two? :) I think this would be perfect for a family of four because then you can’t overeat. I’m bringing these to my husband tomorrow when I go to visit (that kind of makes it sound like he’s in jail but he just has an internship in another city… :)) and I’m sure he’ll love them too. Thanks for an awesome recipe! Yes, yes, and YES. Want. It looks so scrumptious and amazing!! Thank you. Looking at these bars I’d have to say that lots of real butter and drunken peaches are the only way to go. Great recipe! love boozy sweets an we have loads of peaches…. These look fabulous! We are going to make these this week! Thanks for sharing. Also, just in case you would like it, here is our USA Kerrygold Facebook page: http://www.facebook.com/KerrygoldUSA?sk=messages_inbox&action=read&tid=id.337083349711941#!/KerrygoldUSA. Hi Christina! I just stumbled onto this recipe through tastespotting and you made an instant fan! Been through the website and bookmarked a bunch – making these now, but with ginger liqueur. Fingers crossed they turn out as well as yours did! p.s. Made the snickerdoodles, but mine were more like snickerdoodlepuffs. Too much cream of tartar? Hi Fiona! Thanks for writing! You’re sweet :) Hmm..for the snickerdoodles–was your butter at room temperature? Mine was a little too warm, so they easily spread out. Maybe yours was a little too chilly? Happy baking! Excuse my delayed reply since I’m still digging my way through my backlogged posts after being on vacation. But these bars look amazing! I’m not a huge peach person, but I think I could totally get behind them when they’re made this way. Grass-fed butter is better! Welcome to the darkside! Have way too many peaches and now I know what to do with them. Can’t wait to try these. The only whiskey we have in the house, unfortunately, is Wild Turkey. I hope the high alcohol content doesn’t break down the batter. I’ll let you know. Thank you for sharing this delicious recipe. I made these Friday for a friend’s birthday….yes, it was a small celebration, but we still had desserts left over from Easter and the thought of another big pie sitting around was just too much. Perfect size and he loves peach pie, so I went for it. The crust was delicious and the peaches divine! Will definitely be making it again. I had my husband watch your video, because he loves whiskey as well. He said it’s a good thing you are married and WE are married otherwise he would have totally gone after you! Whatever, he’s old enough to be your father, but he digs your style! Hi, just found your site, love it. Will this recipe work with Apricots too ?